NOTICE: Activation key must be used on a valid Steam account. Requires internet connection.ABOUT THE GAMEThe best-selling first person action series of all time returns with the epic sequel to multiple “Game of the Year” award winner, Call of Duty®: Modern Warfare® 2. In the world’s darkest hour, are you willing to do what is necessary? Prepare yourself for a cinematic thrill-ride only Cal… l of Duty® can deliver. The definitive Multiplayer experience returns bigger and better than ever, loaded with new maps, modes and features. Co-Op play has evolved with all-new Spec-Ops missions and leaderboards, as well as Survival Mode, an action-packed combat progression unlike any other. SYSTEM REQUIREMENTS Operating System: 10.9.2 (Mavericks) CPU Processor: Intel i3 (Dual-Core) CPU Speed: 2.2GHz Memory: 4 GB RAM Hard Disk Space: 13 GB Video Card (ATI): Radeon HD 4850 Video Card (NVidia): Geforce 640M Video Card (Intel): Iris Video Memory (VRam): 512 MB Peripherals: Macintosh mouse and keyboardNOTICE: The following video chipsets are unsupported for Call of Duty®: Modern Warfare® 3 ATI RADEON HD 2000 Series ATI RADEON HD 6490M, 6630M, 3870 NVIDIA 9000 Series NVIDIA 320M, 330M Intel HD 3000, 4000, 5000NOTICE: This game is not supported on volumes formatted as Mac OS Extended (Case Sensitive)Other Requirements: To Activate Call of Duty®: Modern Warfare® 3, you will need to be connected to the internet and have a Steam account (free). If you do not already have a free Steam account, get one here and make sure you read the Steam Subscriber Agreement. 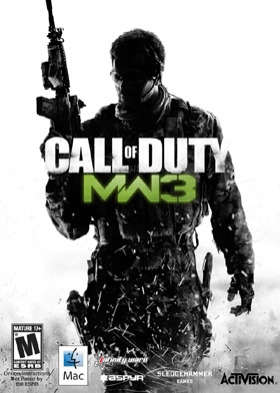 © 2011-2014 Activision Publishing, Inc. Activision, Call of Duty and Modern Warfare are registered trademarks and Call of Duty MW3 is a trademark of Activision Publishing, Inc. All rights reserved. The ratings icon is a registered trademark of the Entertainment Software Association. All other trademarks and trade names are the properties of their respective owners. Published and distributed by Aspyr Media, Inc. “Aspyr” and the Aspyr “star” logo are federally registered trademarks of Aspyr Media, Inc. Mac and the Mac logo are trademarks of Apple Computer, Inc., registered in the U.S. and other countries. The ratings icon is a trademark of the Entertainment Software Association. All other marks and trademarks are the property of their respective owners. Non-transferable access to special features such as exclusive, unlockable, downloadable or online content, services, or functions may require single-use serial code, additional fee and/or online account registration (17+). Access to special features may require internet connection, may not be available to all users, and may, upon 30 days notice, be terminated, modified or offered under different terms. Online play and download requires broadband internet service. User responsible for associated fees. All rights reserved.